Made in ISO9001 and 14001 CERTIFIED FACTORY. You can always count on InkTonerWeb to provide incredibly LOW PRICES and PREMIUM QUALITY on all our compatible Brother toner cartridges. 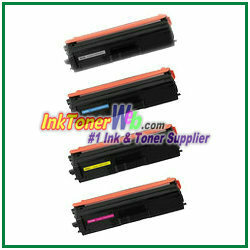 Looking for TN436 toner cartridges? At InkTonerWeb, we strive to provide our customers with the highest quality toner cartridges for only a fraction of the price as to genuine toner cartridges. We are here to help you to save on your printing needs! Our compatible toner cartridges are not refilled, but specifically selected and tested by our manufacturer, our products are guaranteed to give you the same result as in genuine toner cartridges.The high quality TN-436BK, TN-436C, TN-436M, TN-436Y high yield toner cartridges from InkTonerWeb.com are an economical option to expensive OEM Brother toner cartridges. We offer a 100% Quality Satisfaction Guarantee on our compatible TN-436BK, TN-436C, TN-436M, TN-436Y high yield toner cartridges. You can shop TN-436BK, TN-436C, TN-436M, TN-436Y high yield toner cartridges for Brother HL-L9310CDW HL-L8360CDW HL-L8360CDWT MFC-L9570CDW MFC-L8900CDW laser printers online from us. Did we mention our free shipping? If you spend more than $50, the shipping is FREE.